This page is to help those who are new or somewhat familiar to IRC, set up and connect to the Project Ophiuchus chat. There are two main ways to use IRC: Through a client program which needs to be downloaded, or via an embedded Java or CGI client. At this page the only two things that you need to change are the "Nickname" and "Channel" boxes. In the "Nickname" box put in what you want your name to be while on IRC, and in the "Channel" box put in the channel you want to join, in this case "ophiuchus" without the inverted commas. Then click on the [lower left hand button (The arrow and circle) and you'll automatically join the correct channel. From here it is just like an IM program, except on a larger scale. If you don't want another tab or window cluttering up your browser, then there is also the option of downloading a client. 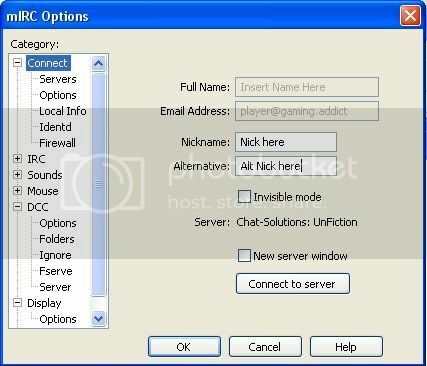 There are many popular ones out there, such as mIRC, or the Firefox addon ChatZilla. There are others out there though, and it is ultimately up to you which to choose. I will be doing this guide for mIRC as it is the one I am familiar with, but it should be similar on most clients. If someone knows how to set up another client, please feel free to add it to this page. After downloading and installing mIRC, the next step is to set it up properly to connect to the correct server, and the Project Ophiuchus channel. Upon starting mIRC up you will most likely come upon a small window asking you to register or wait in order to continue. After waiting long enough to allow the continue button to become active, click it, and you will be taken to the "mIRC Options" window. Under "Full name" and "Email address" you can put whatever you want. People rarely use their real ones anyway. As for "Nickname" and "Alternative" put whatever nickname you want to use under "Nickname" and a backup for if your preferred one is already taken under "Alternative"
After this you will be in the right channel for discussing the game. When using IRC, by typing certain commands into your client, you can do different things. This is a list of some commands you may find useful. Feel free to add to it if you feel I have missed any. /me action Allows you to perform actions within the chat, such as "cidhighwind767 waves to everyone"